Apparently there's a beer renaissance going on in Queens, and Trevor Nelson is going to tell you about one of the breweries and beers that is part of it. Check it out! This beer is one of the first seasonals brewed from Singlecut Beersmiths in Queens, NY. The first micro-brewery to open in Queens since before the prohibition, this craft brewery is a symbol of the cultural shift happening in Queens and the development of a deeper pride for the borough. 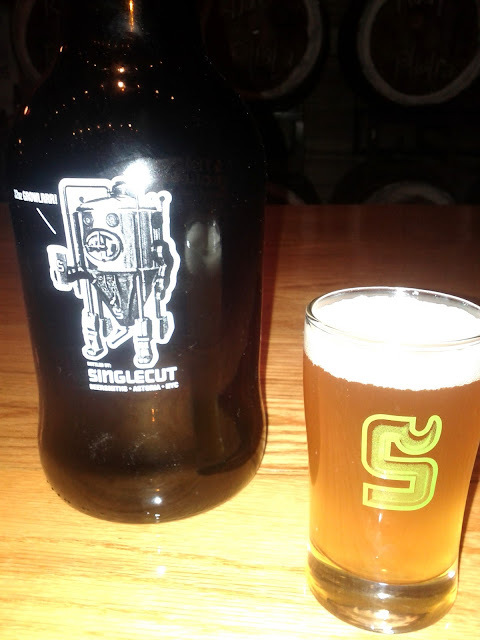 Singlecut prides itself on crafting an often neglected genre in the craft brewing scene: lagers. Or, as Singlecut refers to them, Lagrrr!s. The Jan Olympic White Lagrrr! is a hazy dark caramel color, with a moderately rocky head. The aroma is strongly herbal with a bit of orange, lemon, and sweet malt. On the palate, this beer has a phenomenal balance of citrus, malt and spice with a surprisingly smokey finish. The mouthfeel is refreshing and light. After walking a few blocks from my apartment in the winter cold to Singlecut's tasting room, this beer was a fantastic way to beat back the cold. It's refreshing balance, perfect mix of spices, and gentle smokey finish has made for my new favorite winter beer. The Jan Olympic has been so popular that the brewery has decided to make it a year round beer. If Singlecut is indeed a symbol of things to come to Queens, I'm excited for what comes next. Beer review written by Trevor Nelson, staff content writer and beer fanatic for HomeWetBar.com and GreatGiftsForMen.com.